Happy new year! I hope you all enjoyed the holidays and had a good break. To get started cooking in 2016, I am sharing a recipe that we will be making in my GAPS For Breakfast workshop next week. This workshop is now sold out – sorry! – but I will be holding it again in April 2016. Details of other upcoming workshops are in the sidebar or on my Events page. Chia seeds are not only loaded with nutrients, but also very versatile in cooking. For those with an egg allergy, chia seeds can be used as an egg substitute. Chia seeds can be used to make a delicious gluten-free porridge. And here they are used to make a pan of runny fruit set into a jam, without the added sugar of traditional jam. Instead I have just added a touch of honey for sweetness. 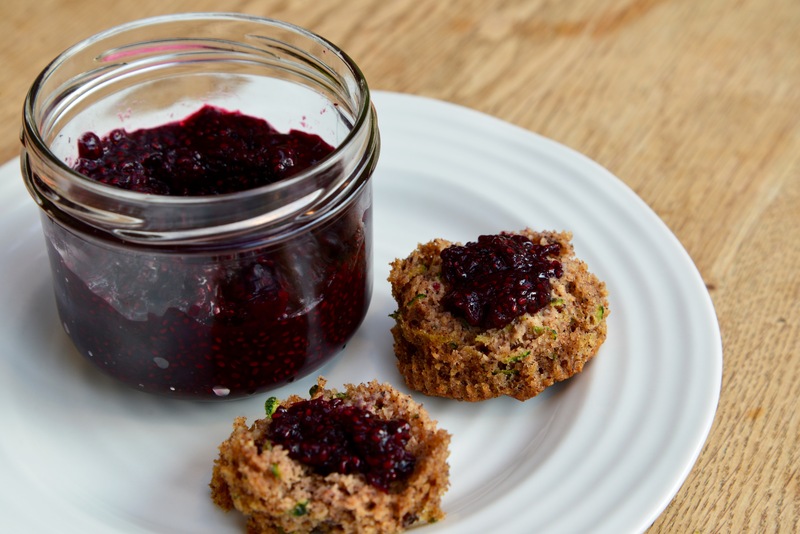 Chia jam is also incredibly quick to make compared to traditional jam, which is more of a “project”. I hope you enjoy it! Put the blueberries and honey in a pan and heat on the hob stirring frequently, until the blueberries have burst and the liquid is boiling. Reduce to a simmer and cook for 5 minutes, stirring constantly. Add the chia seeds and cook for another 10 minutes, continuing to stir. When the jam has thickened, take off the heat and stir in the vanilla extract. Taste and add more honey if necessary. Cool to room temperature, then transfer to a jar and refrigerate. Keeps for up to one week. Blueberries are very hard to get in Israel, but I just recently learned about the gel-creating property of Chia seeds. I will have to try this recipe with another fruit. Do you have any suggestions?